In the 19th century, water buffalo were introduced to Australia as a meat supply for remote northern settlements. These settlements, and their buffalo, were abandoned back in 1949, but despite the buffalo being harvested for meat, hides, and for hunters’ trophies, feral buffalo have continued to spread across the northern floodplains. In the 1980s and 1990s, an eradication campaign drastically reduced the amount of buffalo in the area, but their numbers have grown again, which is causing significant damage to the native wetlands. Water buffalo were first brought to Australia in 1825 to 1843. Introduced to Melville Island and the Coburg Peninsula, the 80 buffalo were intended for use as meat and hides for the local settlers. When the settlements were abandoned, the buffalo remained and quickly started to colonise the permanent and semi permanent swamps, as well as the fresh water springs in the Northern Territory. Australia has two types of introduced buffalo species; the river type from western Asia, with curled horns, and the swamp type from eastern Asia that has swept-back horns. Prior to the culling’s that took place in the late 20th century, buffalo numbers in the Northern Territory were as high as 350,000. Now, there are approximately 150,000 buffalo plaguing the area. 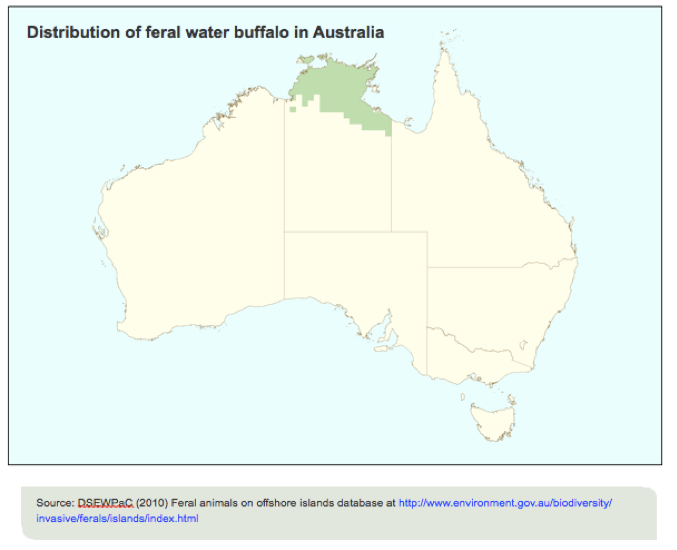 Unlike many other feral animal species in Australia, the buffalos are confined to a relatively small area. Weighing anywhere from 450-1200 kilograms and eating 30 kilograms of food per day, it’s not hard to imagine how greatly the species impacts the local ecosystem. When their population was at its highest, the feral water buffalo grossly altered the character of the northern floodplains. Wallows, trails, dungs, trampling and disturbance were among the biggest contributors to this, as soil erosion, channelling of floodwaters, increased intrusion of saltwater into freshwater habitats, and destruction of wetland vegetation all became commonplace. Many native wetland flora and fauna failed to thrive in the muddied or salt-polluted water. They also suffered from the disturbance and loss of cover. Crocodiles, barramundi, freshwater turtles and other native species declined, and many waterbirds, including magpie geese, lost their habitat. Feral buffalo also cause issues because of the sheer amount of grass and plant life they eat on a daily basis, which eliminates vital food sources for native species. They often damage the trees they rub against because they’re so heavy and their trampling and soil erosion over vast areas leads to the spread of weeds. Feral buffalo also pose a threat to cattle, as they carry diseases like tuberculosis and brucellosis. The biggest attempt to reduce the impact of feral buffalos on the Australian ecosystem was made back in the late 20th century, where aerial shooting/culling took place over a 20-year period. The program experienced the most success in Kakadu National Park where numbers were reduced from 20,000 to less than 250. However, the difficult terrain made full eradication impossible. Local and international demand for meat, especially for pet food, and the demand for their hides and horns, game for hunters and live exports has also seen some 700,000 animals eradicated since their introduction. Farming of re-domesticated herds has also increased, particularly among Indigenous communities. What To Do With Australia’s Feral Cat Population? What’s the Deal with Australia’s Feral Goat Populations?